In yesterday’s post I mentioned that breeders have a new way of finding closely related breeding groups. Genetic markers allow scientists to map out the relationships between the different breeds. This type of analysis was how the Abaco Barbs were identified as belonging the the Colonial Spanish breeding group. This can be really useful for feral herds like the Abacos where there are conflicting theories regarding the origin of the horses. Studies like this can turn up surprising results. In this particular one, the distance between two breeds that many would have assumed to be closely related – the Percheron and the Boulonnais – were actually quite distant. Both breeds are large, grey drafters from the same part of the world. Some historical accounts even suggest that the latter was used to create the former. And yet the Percheron is more closely related to the Norman Cob (technically a light breed) and the stout, silver dapple Comtois than to the Boulonnais. Here is a chart from that paper showing one method used to group the breeds studied. Sometimes the results of these kinds of studies vary a bit in the details, depending on the specific samples used (this one used a pretty large set) or the specific markers being studied. Others are really consistent from study to study, like the grouping of Nordic breeds, highlighted here in pink. Of course, it is heresy in many Fjord and Icelandic circles to suggest that these horses are ponies. For that matter, the other group that falls into this same cluster (although not used in this study) is the Miniature Horse, which many admirers adamantly insist is not a pony either. 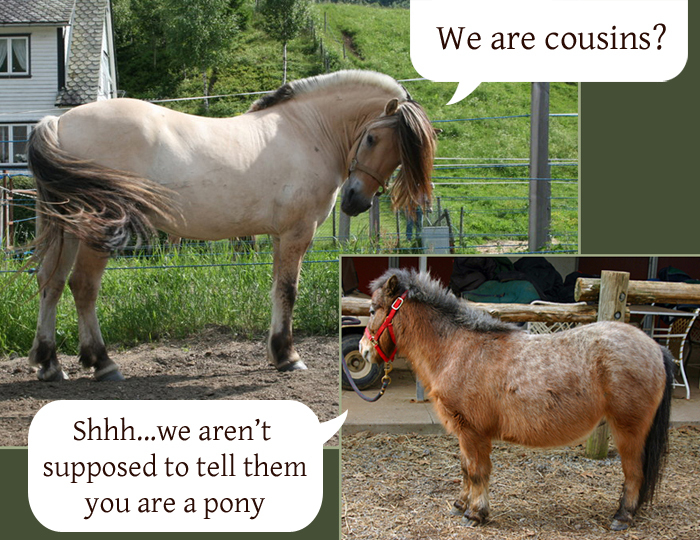 Of course, it is hard to maintain that position when your closest relative is the quintessential pony, the Shetland. 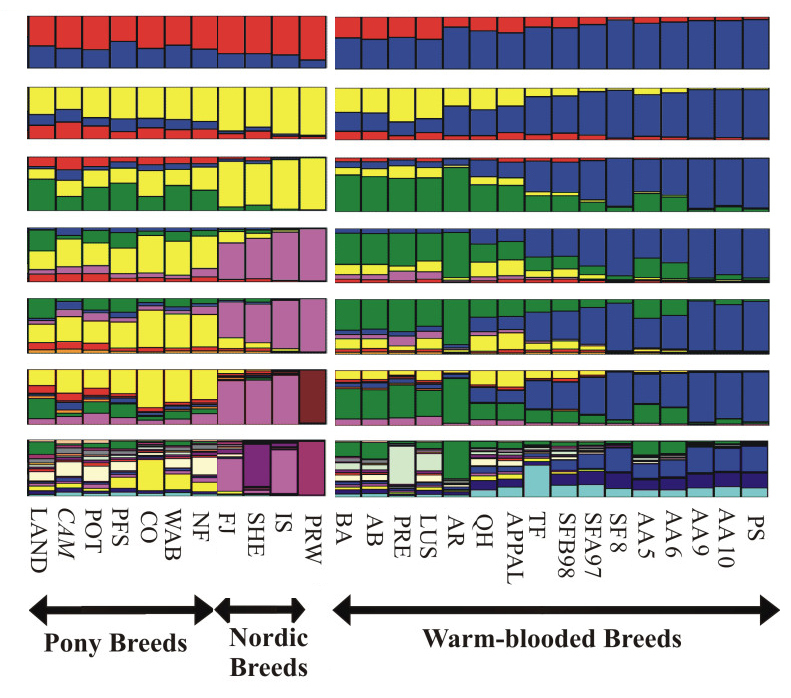 Swapping the sections of the chart around, though, shows that the graphs for these Nordic breeds look more like the section of the graph for the other ponies than for the light breeds. Those are the breeds most Americans imagine when the word horse, and not pony, is used. This is still really new science, but these kinds of papers have been appearing with increasing regularity. Hopefully they will one day provide an even clearer picture of how the different breeds developed and are related. But even with what we know now, it is possible to make more educated guesses about what needs to be preserved, and what might be the best path to take for those breeds with limited numbers. 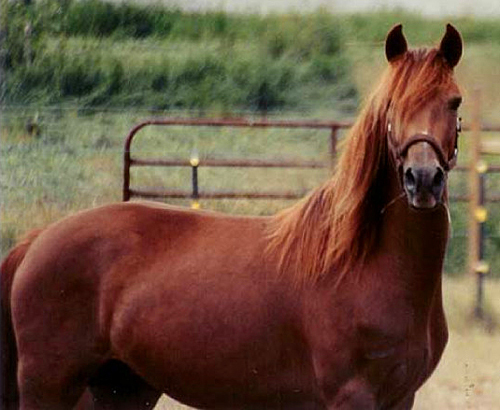 The new information will probably require that we lose some of the mythology that has surrounded many of our breeds, but the benefit should be healthier horses in the long term. 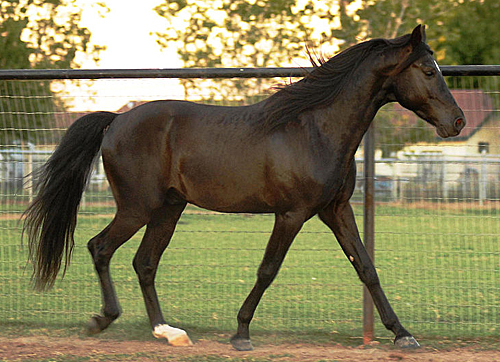 Although it’s not about horse color, polydactyls are fascinating in terms of genetics. Here is a good blog post about them, complete with a radiograph that shows where the extra digit originated. My youngest son is an avid video game player, so he was highly amused to learn that one of the genes involved in limb development – and therefor in polydactylism – is called Sonic Hedgehog (Shh). Here is a good article on Hemingway’s polydactyl cats that explains the hedgehog genes. In the previous post I mentioned the curious fact that zebra hybrids had more stripes than their zebra parent. So how does an animal with some stripes, bred to one without any at all, produce offspring more extensively striped? According to the theory offered by developmental biologist Jonathan Bard, it’s all about the timing. The amount of striping depends on when the pigmentation initiates during embryonic development. The interval of striping is the same in each species – he postulates every 20 cells – but starting earlier means there are fewer cells. Alternating colors every twenty cells won’t give you quite so many stripes. That is why the Burchell’s Zebra has such sparse, but broad, striping. It is estimated that striping here began 21 days into development. If you wait a little longer, when the developing fetus has more cells, that same 20 cell interval will give more stripes. 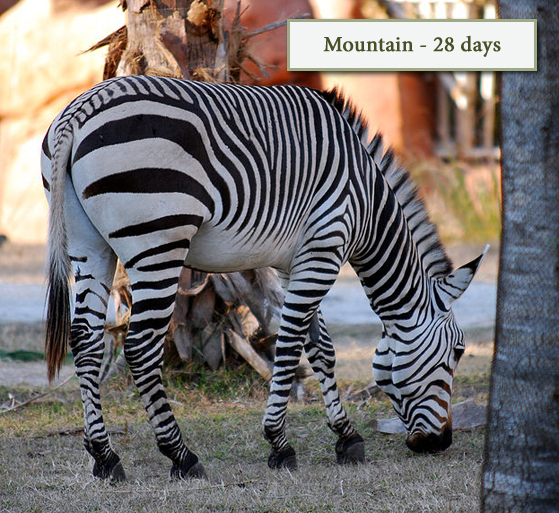 This is a Mountain Zebra, with stripes estimated to start at 28 days. 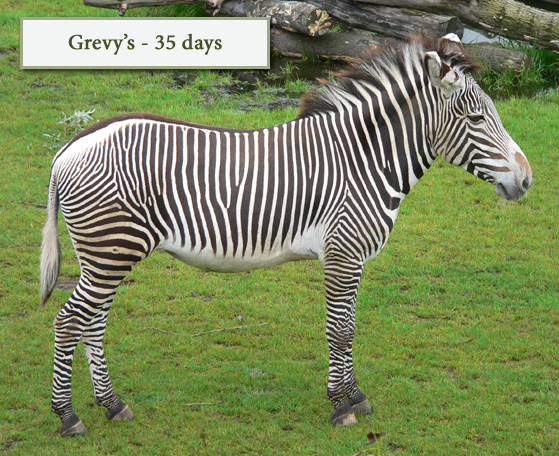 And finally there is the heavily striped Grevy’s Zebra, with striping initiated at 35 days. That late in development, when the fetus was made up of many more cells, the twenty-cell interval created a lot more stripes. This theory could explain why a hybrid might have more stripes than the parent. It wouldn’t need a genetic mechanism to tell it to make more stripes; it just needs the mechanism already there to be delayed a little. 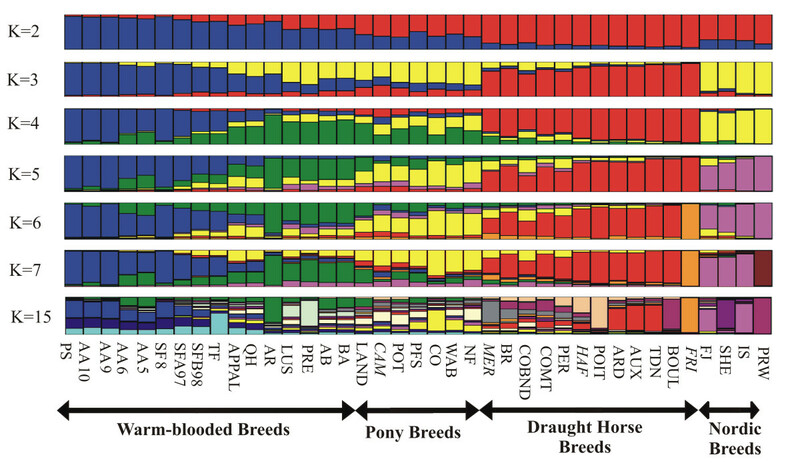 That is the part about zebras and their striping that has implications for horse color. If this can work for striping, it could work for other forms of patterning. 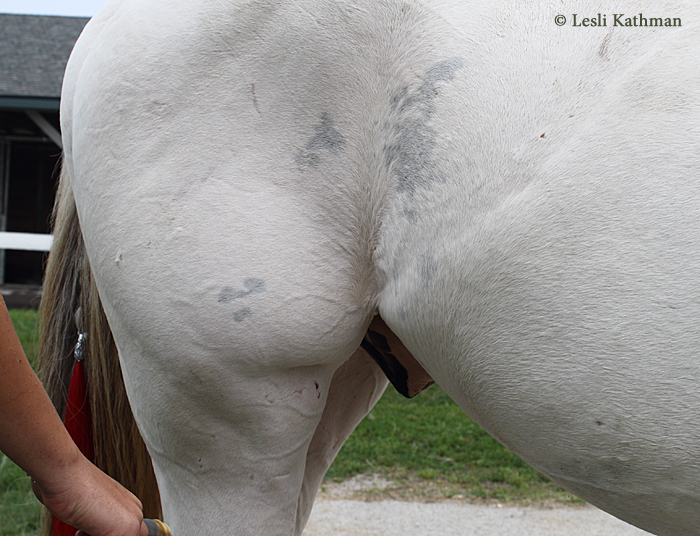 It might not be necessary for a horse to have some genetic component that said “make more spots”. All that might be needed is something that set the stage for those spots to start later in development. Certainly this situation calls to mind the kind of changes in spot size and frequency seen in horses with some types of sabino patterning. For anyone interested in a more detailed explanation of Jonathan Bard’s theory, this post has a detailed but still easy-to-understand explanation. I would also highly recommend the book that first alerted me to it. I have been thinking about zebras lately. Part of the reason is probably best left for another post, since it’s a different tangent than this one. As readers of the studio blog know, I tend to wander off on tangents a lot. I do eventually get back to where I was, though it often takes a while. Oddly enough, this will bring us back to Dominant Whites, though a bit indirectly. The other reason is that I recently ran across my copy of the Penycuik Experiments by Professor James Ewart. The Penycuik Experiments were conducted in the late nineteenth century. I originally found the book when looking for information on the Highland Ponies of Rhum, which are interesting because they are associated with the silver gene as well as the “tiger eye” trait. The text proved to be a dead-end for that, but the experiments described were really cool. I thought it might be fun to share them here, in part because the hybrids are interesting and in part because the experiment itself is a wonderful illustration of just how far we have come in our understanding of genetics in the last 100 years. Professor Ewart was interested in disproving the theory of telegony, which was the belief that offspring from a cross could be influenced by the traits of the mother’s previous mates. While this might seem quite silly now, at the time the idea was almost universally accepted. Darwin mentions it in The Variation of Animals and Plants under Domestication, citing a case where a mare was crossed on a quagga and later produced horses with striping. The Penycuik Experiment was an attempt to recreate that situation to see if the theory of telegony held. 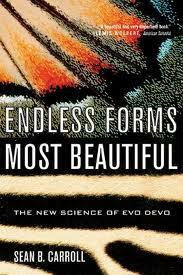 The experiments are particularly interesting in that they predate the re-discovery of Mendel’s work by a few years. 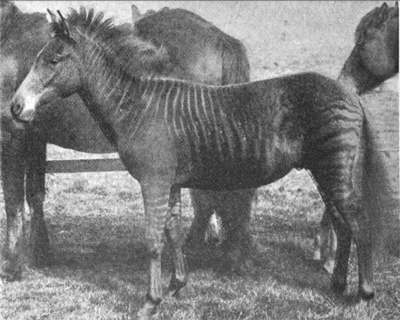 The last quagga died in captivity in 1883, so Ewart used a Burchell Zebra stallion, Matopo. He crossed the Matopo, who is pictured at the top of the post, with a wide variety of mares. 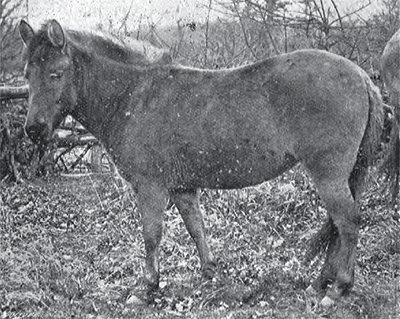 Among the first of the hybrid foals was Romulus, from the black Highland mare, Mulatto. Most of the other hybrids looked much like Romulus – reddish brown ground color with an overlay of black stripes. Ewart also includes photos of the zebra hybrid bred by Lady Meux. 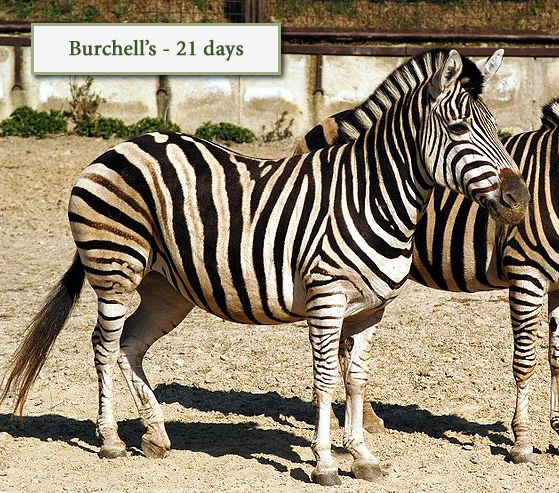 In that case a Burchell’s zebra mare was crossed with a “Highland or Shetland Pony” with wall eyes. He was said to be “light bay”, but in the photos above he looks chestnut. 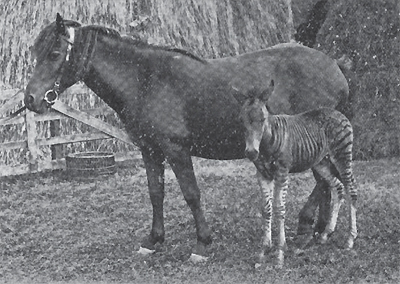 Unlike the other hybrid foals, his daughter does not have particularly visible striping. She also looks like she might be chestnut, though it is hard to tell from an old black and white photograph. 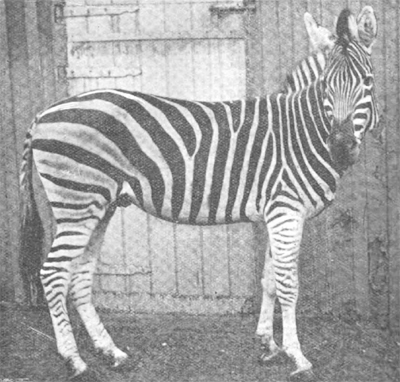 Another zebra hybrid, Birgus, was said to have grown up to be chestnut with black stripes. He was by Matopo and out of a chestnut polo pony mare. Photos of modern zorses suggest that in addition to black striping, the chestnuts also have black lower legs much like a wild bay. What is interesting is that none of the hybrids in the Penycuik study had white markings of any kind. 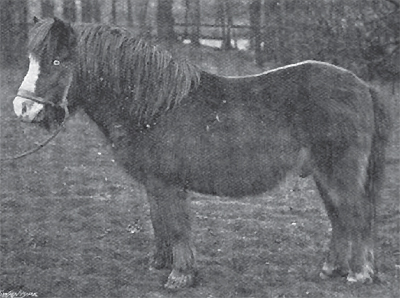 In addition to the wall-eyed pony stallion, one of the mares used by Ewart was a Clydesdale mare. White patterns can trump the zebra striping, which many have seen with the well-known tobiano zorse Eclypse. The interesting thing about Romulus, and indeed all the other zebra hybrids, is that they had more stripes than their zebra parent. Ewart counted 43 stripes on Romulus, compared to the five between the shoulder stripe and hindquarter for Matopo. That seems counter-intuitive, that crossing an unstriped animal with a striped one might give the resulting offspring more stripes. That brings me to the other tangent I mentioned earlier. Tomorrow I’ll post about embryonic development and spot frequency, because that’s more really cool stuff. In honor of the day, it seems a good time to explain one of the basic concepts in genetics. I had a few people ask me privately about the wild bay variation, so I thought it might be helpful to include the explanation here where I can use pictures. Often when I talk about coat color genetics, I use the image of a light switch. That is because one of the most common stumbling blocks to understanding is the idea that unrelated colors have dominant or recessive relationships. This misconception is clear when one hears things like “grey is dominant to black”. In fact, those two colors are controlled by separate, unrelated genes. Dominance is about how genes relate to their opposite, so instead of grey being dominant to black, grey is dominant to not-grey. The light switch is useful, because viewed this way gene pairs can represent “on” and “off”. Is the horse grey? (Is the switch on?) Is the horse not grey? 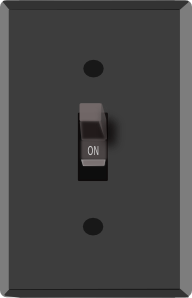 (Is the switch off?) The image makes it easier to understand how genes relate to one another. This works because many genes are like grey, and only come in two versions: “yes, it is there” and “no, it is not there”. The analogy falls short, though, when talking about the genes that have more than those two options. The proper term for a different version of the same gene is allele. Genes with multiple alleles need a different approach. 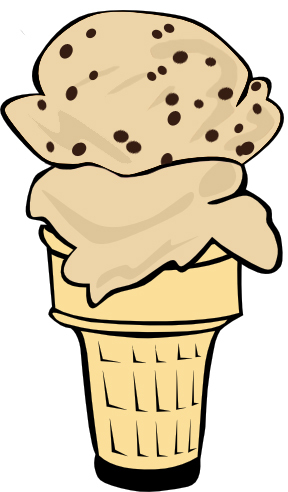 For those genes, it is perhaps better to image the gene as an ice cream cone. 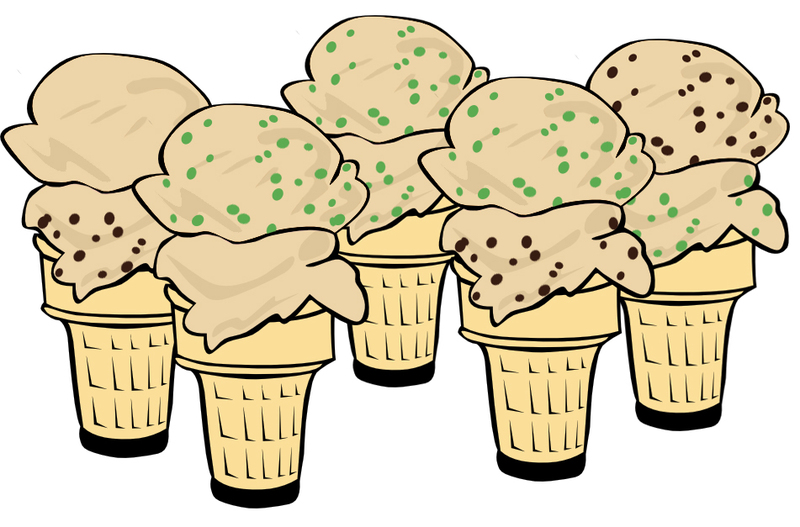 I have an ice cream cone (locus) and two scoops (genes) – one serving from each parent. For the moment, my options are vanilla with chocolate chips (the “on” from my switch analogy) or plain vanilla (no chips, or “off”). This gives me three possibilities – two vanillas, two chips, or one of each. This goes back to the classic 3:1 ratio discovered by Mendel, and familiar to most high school students taught to use a Punnett Square. This could easily illustrate the situation with a simple dominant gene like grey. Now we’ll make it more interesting by added a new option. Here we have mint chip ice cream. It is still ice cream – it still belongs on a cone (the locus) – but it is a slightly different flavor. And I still have the option of no chips (off) or chips (on). It is simply a variation, an additional allele, of what I already had. This makes things more complicated because I can mix and match any of the options. I can have no chips, mint chip or chocolate chips in any combination. The only limit is that I still only have room for two scoops. I have more options, but I still just have two parents, each giving me one serving. So I can have two scoops of mint chip, but if I do there is no room for a serving of chocolate chips. From a genetic standpoint this is an important distinction because in most cases the genes, and therefor the colors, are completely separate. 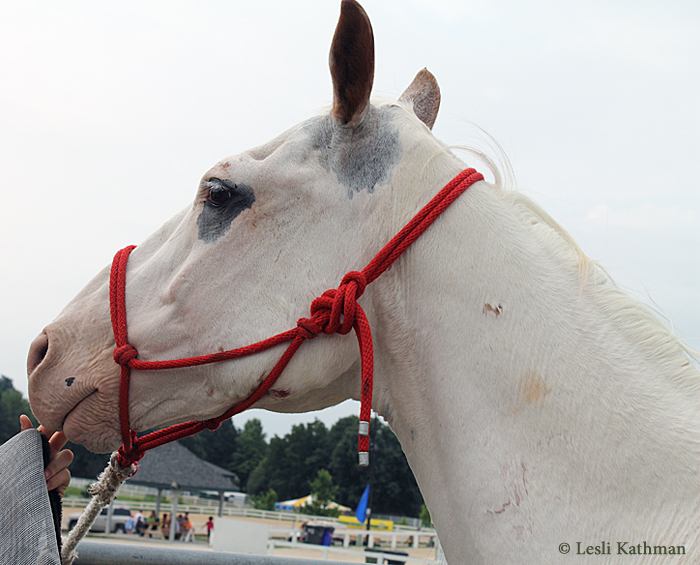 That means a horse can inherit colors without shutting out the possibility of others. When colors are variations of the same gene – when they are alleles – they actually do shut out possibilities, because there are numerous possibilities and only room for two genes. It also makes dominance more complicated, because not only will “on” or “off” be dominant, but one of the two alternate versions will have to be dominant over the other. Going back to the color that started the discussion, wild bay is one of four options at agouti. (That means for our ice cream scenario to work like bay, we’d actually need a third flavor of chips!) With bay the other options are regular bay, seal brown (sometimes called black and tan) and black. Because agouti (bay) regulates the production of black pigment, black can be thought of as the “not bay” option because the black is obviously not being regulated. The other agouti options are all dominant to not-bay (black). Wild bay is presumed to be dominant to regular bay, which is itself dominant to seal brown. That follows the general rule for mammals that colors that allow more expression of red pigment are dominant to those that allow less. The important thing to remember is that all four options are at the same place (on the same ice cream cone), so a horse can only have two. They can have any combination, but still just two servings.